Valid photo I.D. required to claim seats. Seats may be claimed at door open time for show you are attending. Seats guaranteed until show time. Will call tickets must be picked up by the purchaser only. Alternate names for will call will not be allowed. 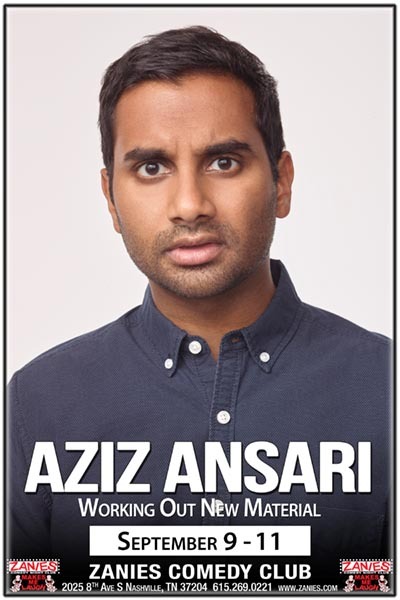 *** No cellphones, cameras or recording devices will be allowed at Aziz Ansari’s Working Out New Material show. Upon arrival, all phones and smart watches will be secured in Yondr pouches that will be unlocked at the end of the show. Guests maintain possession of their phones throughout the night, and if needed, may access their phones at designated Yondr unlocking stations in the lobby. All guests are encouraged to print their tickets in advance to ensure a smooth entry process. Anyone caught with a cellphone in the venue will be immediately ejected. We appreciate your cooperation in creating a phone-free viewing experience. Oh Brudder Productions own all rights in the content and materials, including any jokes and sketches (the “Materials”), delivered during his performance. The Materials may not be copied, translated, transmitted, displayed, distributed, or reproduced verbatim (the “Use”), in whole or in part, in any form, media, or technology now known or later developed, without the express prior written consent of Oh Brudder Productions. Any Use of the Materials without the express prior written consent of Oh Brudder Productions is strictly prohibited and shall be subject to all available legal remedies, whether in equity or at law at the cost of anyone who violates this prohibition.